The recent Going Global event in London for businesses looking to expand internationally provided attendees with a wealth of country specific information, especially regarding Brazil, Russia, India and China, but many speakers also focused on the more general aspects of culture, etiquette and communication in international business. Communication problems are not just down to language but also down to culture. In some cultures, people are loud, direct or even blunt and tend to interrupt others during their conversation. In others, people are more soft-spoken, use flowery or indirect language and wait patiently for others to finish what they have to say. These differences can have a huge impact on business meetings, correspondence, emails, etc. Try to adjust to the way your business partners communicate. Hierarchies may also influence your communication style in your new surroundings. Failing to acknowledge someone’s status within a company and addressing them with due respect can leave a bad impression. Avoid referring to how things are done in your country as this may seem condescending or irrelevant to your foreign audience. The same goes for culture-bound references, which people from another country than yours will either not understand or find uninteresting. Jokes are also controversial as they don’t translate well. Black humor or sarcasm may be hilarious in one culture, but strange and offensive in another. 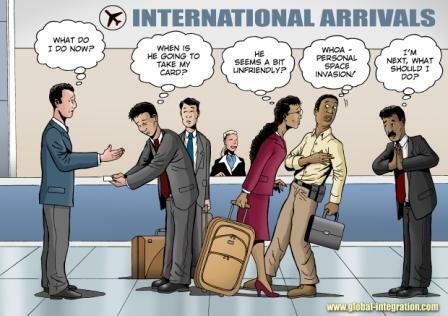 According to speakers at Going Global, the biggest single difference in how people from different countries approach business is that in some countries business comes before personal relationships, while in others personal relationships come before business. At one end of the spectrum you have countries like the UK, US and Germany, which clearly put business before relationships. At the other extreme you have Japan, where relationships come first. In fact, except for a few countries like France that are somewhere in the middle, most of the world, including the rest of Asia, the Middle East, Latin America and Africa, closely follow the Japanese. Since countries where business comes before personal relationships are clearly in the minority, the impact of culture on international business will become of increasing importance to them as economic power shifts to emerging markets, especially to China and Asia, where most economic growth will come from. Many business people will have to learn how to build personal relationships before getting down to the nitty-gritty of business and closing that multi-million deal. When comparing business cultures there is always a degree of similarity and a degree of difference. They are never exactly the same. The trick is to build bridges via the similarities and be aware of the differences that exist so you can prepare for the problems that may arise from them. We are all guilty of cultural bias, which is why people elsewhere don’t always see us as we see ourselves, but we should at least try to maintain a high level of objectivity to avoid misunderstandings. In a nutshell, build self-awareness, recognize the complexity, respect differences and avoid stereotyping. Be inquisitive, listen actively, think twice before acting and stay flexible. No Replies to "The impact of culture on international business"